As part of the Paris 2015 Climate Conference – COP21, the service for Science and Technology of the French Embassy in China wished to encourage Franco-Chinese scientific actions related to climate change and biodiversity. A prize (a stay in France) has been awarded during the evening organized by the CNRS China office in Beijing to a Chinese researcher working in a Franco-Chinese joint research network particularly mobilized on these issues. The winner is Dr Li Li, a member of the GDRI EHEDE, for her works in Yunnan on the impact of global and regional changes on the Black and White snub-nosed monkey. 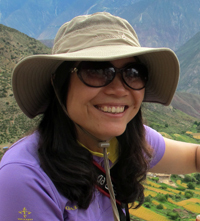 Dr. Li Li is an expert researcher in geographic information systems and conservation biology. She holds a doctorate from the Sun Ya Tsen University of Guangzhou (Canton), obtained in 2007. After joining the Yunnan University of Finance and Economics (YUFE) in Kunming as an associate professor, Dr. Li Li spent a sabbatical in the UFC UMR / CNRS 6249 Chrono-environment, University of Franche-Comté (UFC), Besançon, from the 28th of September 2010 to the 29th of September 2011. She wanted to train in landscape ecology and health ecology. Upon her return, she created a research laboratory "Wildlife management and ecosystem health" in 2012, within the YUFE, with the support of Pr. Patrick Giraudoux (IUF and Chrono-environment dept). By specific conventions, the laboratory "Wildlife management and ecosystem health" has access to research stations in Yunnan, located in a number of large nature reserves such that of Gao Li Gong Shan (2300 m alt. ), Tacheng (3000 m alt. ), Laojun Shan (3400 m alt) and Bai Ma Shue Shan (3900 m alt.). The laboratory "Wildlife management and ecosystem health" is part of GDRI "Ecosystem Health and Environmental Disease Ecology". Within it, Dr. Li Li, in collaboration with UMR 6249 Chrono-environment and UMR 6049 ThéMA (University of Franche-Comté) carried out research on the spatial and functional habitat connectivity between isolated populations of the Yunnan snub-nosed monkey and proposed habitat restoration measures (Li et al., 2014, Oryx), evaluated the impact of major roads on the isolation of populations, through the application of graph theory (Clauzel et al. 2015 submitted to Biological conservation), and is currently working on estimating the impact of global warming on the altitudinal distribution of the Yunnan snub-nosed monkey species habitats (Li et al., in prep). In 2014, in addition, Dr. Li Li has laid the foundation for a research program on the conservation of wild elephants, another iconic species for China, in southern Yunnan. To do this, a joint collaboration has been established with the LTER site Jurassian Arc (reference for sustainable management of species problem in agriculture / hunting / conservation) and the LTER site Hwange (reference for sustainable management of the African large mammals). For the record, Yunnan is one of the hotspots of global biodiversity: representing 4% of China’s surface, it has 60% of the Chinese higher plant species, and half of the bird and mammal species, on a gradient from the Tibetan plateau to elephant tropical forests. The mutual advantages of collaborations between French and other international research units and this laboratory are obvious.